I read this book some months back and was intending to review it immediately. But then something happened—I got crazy busy! I took on a new ministry role and pretty soon I had a full diary, began skipping exercise, let my good eating habits go, kept myself awake at night thinking about things, and couldn’t even find time to finish a summary/review of what is a fairly short and simple book. 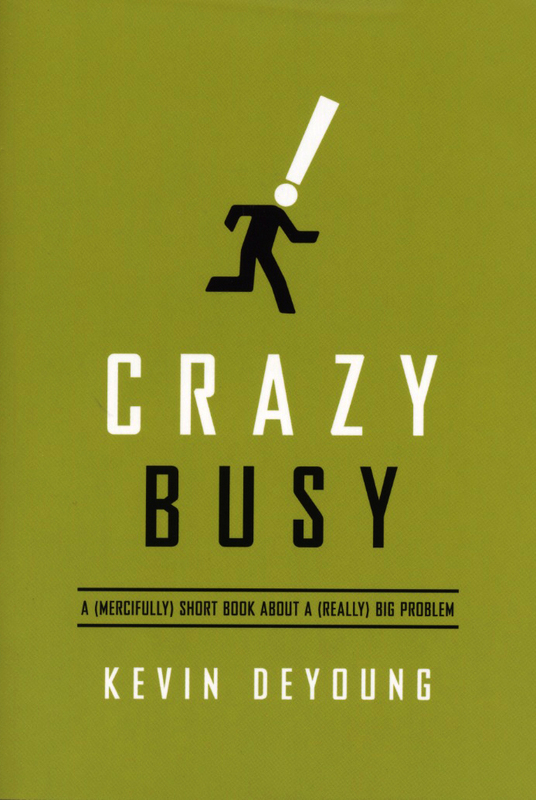 Crazy Busy: a (mercifully) short book about a (really) big problem is a book for Christian leaders that was always destined to be a best-seller. I’ve yet to meet a pastor who doesn’t cry ‘busy’. To be honest, it’s rare to meet anyone these days who doesn’t lay claim to being crazy busy. Busyness is epidemic in our fast-paced, technologically-advanced, opportunity-laden, affluent, western societies. All the ridiculous promises for the future—that we will have so much time on our hands that we won’t know what to do with it—were just that: ridiculous promises. In fact, in some circles busyness is worn as a badge of honour. Unless someone is busy they shouldn’t be taken seriously. The second diagnosis has to do with obligation. Are we trying to do what God doesn’t expect us to do? We need to be reminded often that we are not the Christ; that the gospel is great news of joy—not a demand of all that must be done; that care is not the same as do; that we have different gifts and different callings; that the church is a body with many parts; that prayer is something positive and practical we can do; and that even Jesus didn’t do it all. Above all, we need to remember that it’s not up to us to keep the universe going—God has that covered. De Young’s third diagnosis focuses on mission creep. He reminds us of the importance of setting and sticking to priorities. Jesus recognised that there were so many good things he could do, but he would not let the good get in the way of his number one priorities. Jesus was not ultimately driven by the needs or the approval of others. He was focused on his divine mission. Not that we are on a mission from God in the same vein as Jesus, but the point is that if Jesus had to set and stick to priorities, then so must we. We simply cannot do everything and nor should we try. Fourthly, we are warned to stop freaking out about our kids. He reminds us that it’s harder to ruin our kids than we think and it’s impossible to guarantee their future successes. In trying to do more and more for our kids we may be increasing the build up of stress in our lives and theirs. De Young refers to a Galinsky survey of more than thousand children in grades three to twelve. He asked the kids what was one thing they would change about the way their parents’ work was affecting them. The fifth diagnosis looks at the impact of the screen and technology. De Young confesses that he used to roll his eyes about technophiles, until he became one! We’re warned to take seriously the threat of addiction to all our devices. Multiple lines of instant communication can be a continual distraction to achieving anything productive. Our busyness makes us more prone to descending into trivia and mindlessly tuning out in front of the TV or the internet. It’s hard to be alone when we are ‘on call’ all the time—and being alone is important. We need to ask the hard questions about whether our new technologies are making our lives simpler, or more complicated. What steps should we take to ensure that such things remain our servants and don’t become our masters? The final diagnosis is a surprise one. We are busy because we are supposed to be busy. We’re too quick to assume that life was intended to be easy, comfortable, relaxed, calm. The reality is that we are sinful beings living in a complex world. We should expect to struggle with tiredness, illness, confusion, complex relationships, burdens and busyness. Sometimes our problem lies not with the circumstances but with our attitudes to them. We’re caught out, confused, and we don’t know how to respond. De Young’s answer is to point us to Jesus. We are encouraged to spend time ‘at his feet’ listening to his words. We’re called to devote ourselves to the Word of God and prayer. The problem is, when I hear this, it can sound like another busyness burden to add to all the others. And so I need to be reminded that it is God’s word that refocuses and refreshes me. It is through prayer that I can unload my burdens and anxieties upon God. Beginning the day with God helps me to keep perspective. To Do lists, difficult conversations, meetings, preparation and planning, sermons, studies, and everything else, need to be seen from the perspective that only God’s word can provide—eternity. And so I will learn again to humbly ask for God’s wisdom, grace, and strength, to do what he would have me do, for his glory. it was something like anything you do with you body is spiritual. Interesting that poor planning appears under the pride heading — how does that work?! Failure to delegate and hand over tasks to others. Failure to delegate is a part of poor planning, certainly! Not the whole — but that’s a whole ‘nother book, I would think. Next Next post: Will you be my Facebook friend?